I pulled out my Dylusions Creative Journal. 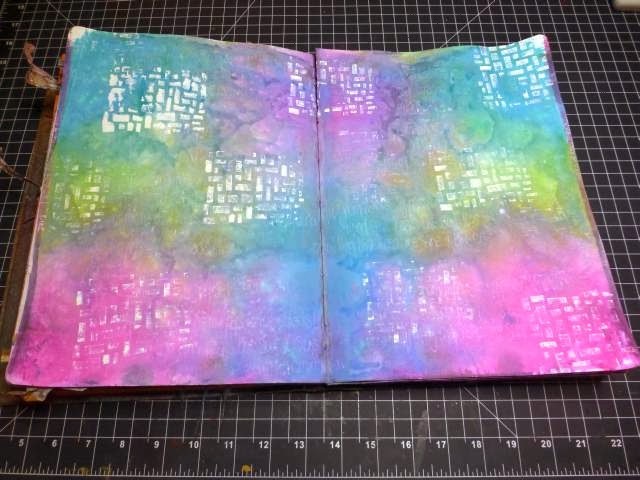 This time instead of water I added the White Linen Dylusions Ink Spray to both pages of the journal. (Make sure you shake this stuff up. It's got a little metal ball to help mix the goodies inside.) 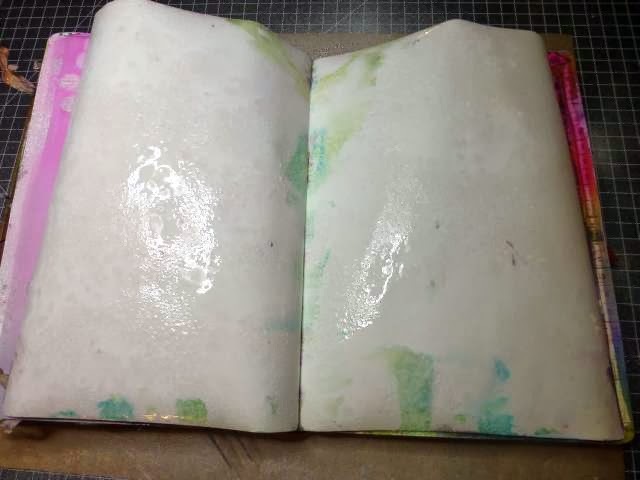 I sprayed the pages completely with the White Linen Dylusions Ink Spray. I couldn't remember whether she spritzed it with water after, so I just used the White Linen spray. Next, I chose Cut Grass, Vibrant Turquoise and Bubblegum Pink for my page colors. I sprayed BIG puddles of the Bubblegum Pink in the bottom right and top left corners, then the Vibrant Turquoise in the other corners. I filled the center with Cut Grass. This is where the magic happens! At least for me! I LOVE THIS PART!!!! Can You Tell???... I could do backgrounds all day just because of this step! 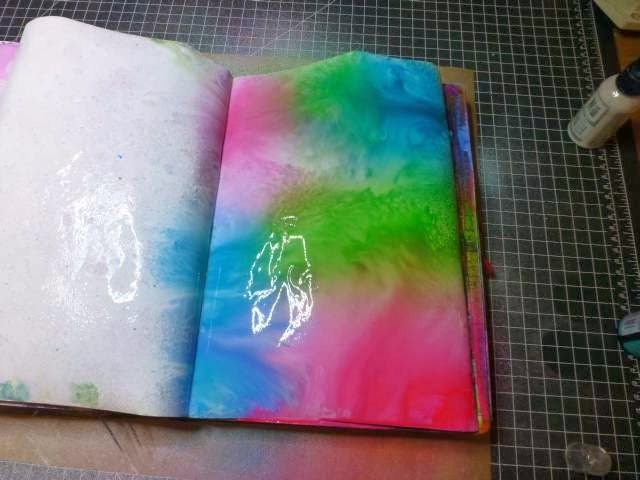 Close the book and let all the colors MELD together forming their MAGIC! Open the book and Voila! Instant Goodness! 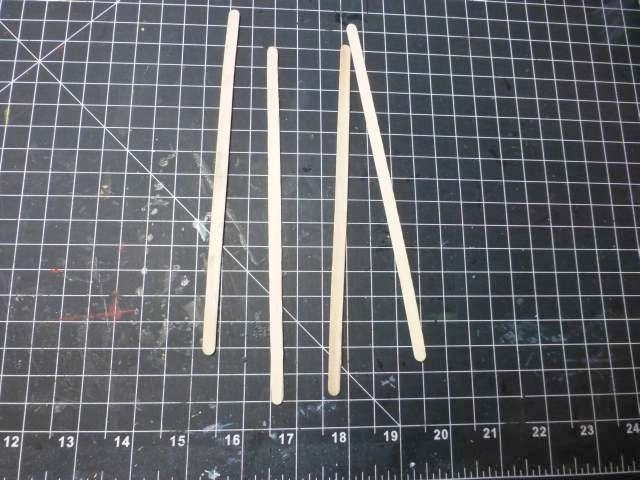 I then took my heat gun and dried the pages a bit. There is lots of ink on these pages and this helps speed up the process. As Dyan says, "Don't Cook It...Just Waft It." Well, I wafted just to the point of cook...LOL! 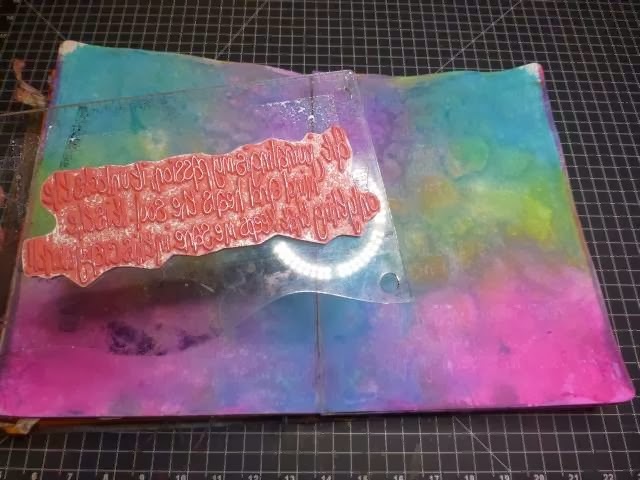 Now that the pages were dry, I used the White Linen Spray on Dyan's Stamp pad and stamped the new The Write Words to the background. For added background noise I used the new Graphic Backgrounds Brick and the Circles stamp. Now it was time for Dylusions Fancy Florals stamp all around the border. 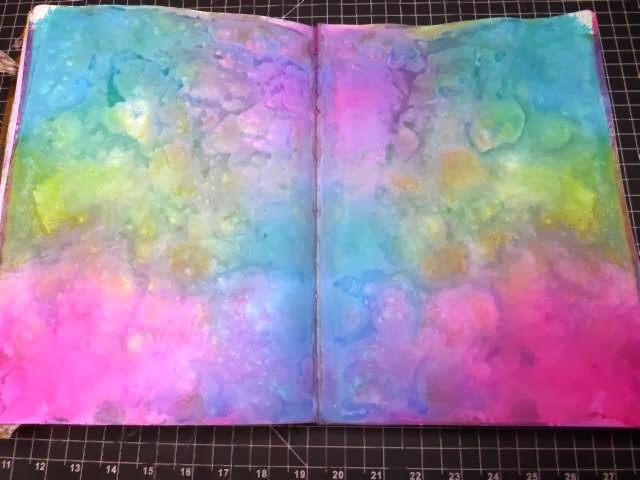 I did this with Ranger's Black Archival Ink. 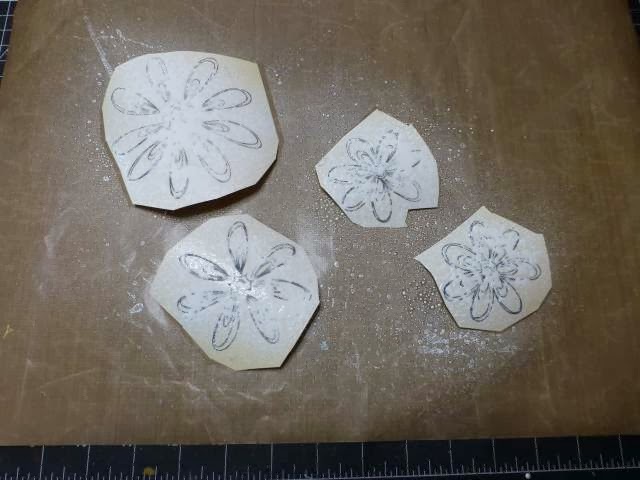 I used another size flower from Dyan's set and over-stamped around the flowers. 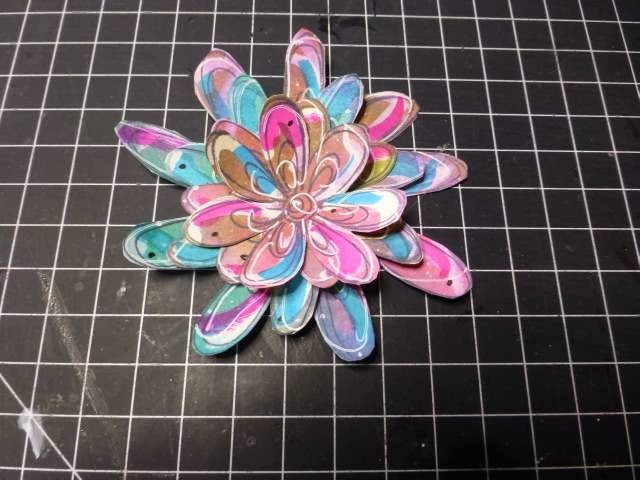 Last, I added another flower with the bleaching technique. I doodled around the flowers with the Uniball Signo white pen and a black Sakura Micron. 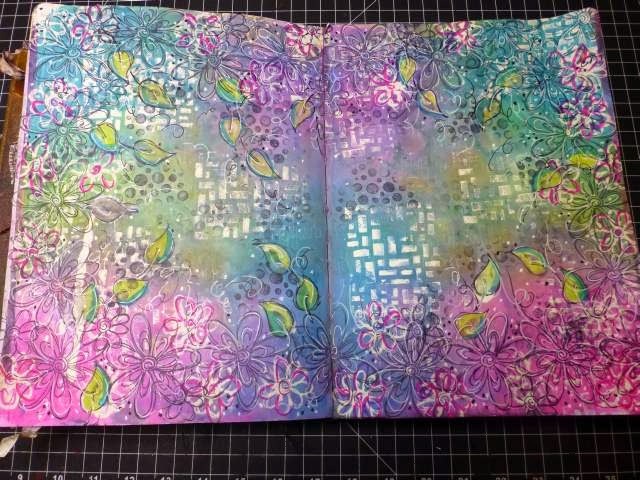 I used some of Dylusions leaves and stamped them into the border as well. Have an Awesome Sunday Y'all! This is beautiful, thank you so much for the tutorial. Now I just need to get my hands on Dyan's new images. Call The Crafty Scrapper in Waxahachie, Texas. She somehow gets this stuff fast!! They will ship to ya...J. A LOT of work but impressive when finished. WOW! Love how this all turned out. I'm going to have to try it with what I have. Still need to get all the new colors and the stamps. Thank you so much for sharing! I love this technique and I am definitely doing this technique in the very near future...maybe even today! Insane... Love the pages. Thank you for sharing, and you'll bet I try to make the pages. I have all 18 (are there more) colors... Want to do it at once..
Jim, this just brightened my day! Thank you for sharing it. I love it. Somehow mine never look so good. Great!!!! Yes, I really, really like this! What a great technique - thanks so much for sharing! 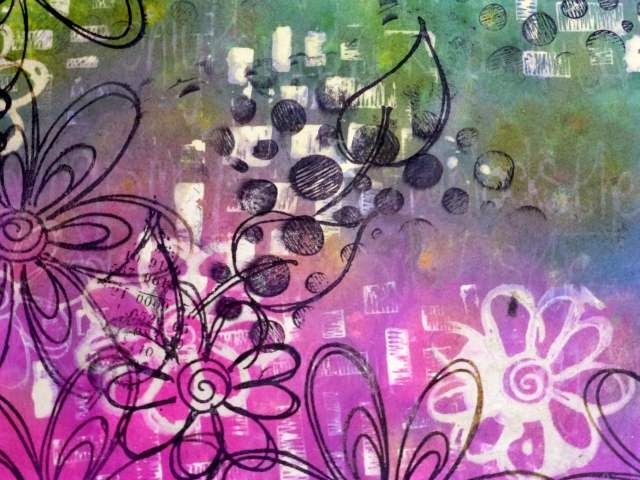 Wonderful layered background, wonderful colors! 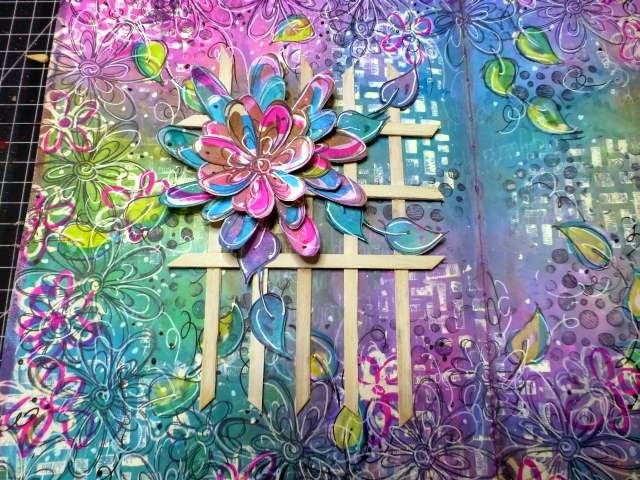 I love the dimension added by the trellis, flower, and leaf! This is absolutely beautiful! The colors are great, love the white linen. oh I LOVE it Jim!!! holy cow..really beautiful!! That was so cool! I have to try that !! I like it.. I love it... I want some more of it!! Gorgeous... Gorgeous!!! 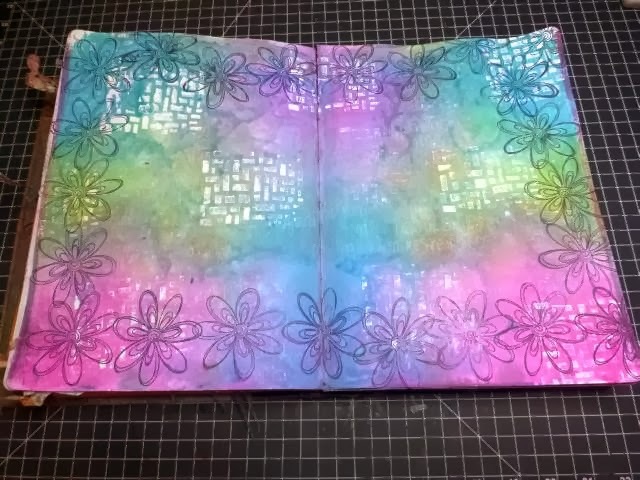 I love your pages; they turned out fabulous!!! Hugs!!! Fantastic! Haven't seen this technique before. Thanks for the tutorial. Wonderful tutorial. Thanks for sharing!!! Beautiful pages, Jim! Love that white linen technique. Jim, this is absolutely BEAUTIFUL! You are such a wonderful Artist!!!! Very cool!!!! I love the smooshing - thank you for the tut! This is awesome. I think I've got spray envy. You are soooo creative!! This is just gorgeous!! Love the colors and the layout! Thanks for sharing! This page is absolutely amazing!!! Oh Wow!!! I could never pick what part is my favorite!!!! 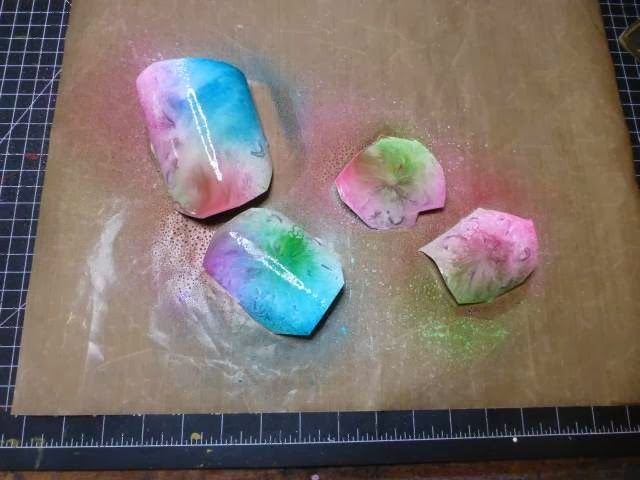 The entire process, techniques, colors and end result!! Every time I think there is no way to top this..and you do! those colors are literally popping off of the pages!! WOW ,,,, absolutely gorgeous!!!! So glad you walked us thru the process. Am looking forward to trying it out. Thanks so much. New to your blog and this is stunning. I'm going to investigate the rest of your creations and videos. Thanks for showing this process. I will be picking up a few of these new toys. This is absolutely stunning. I really must give this a try. Thanks for sharing. Now you have me wanting try something like this. Fabulous background, also love the trellice and flower. 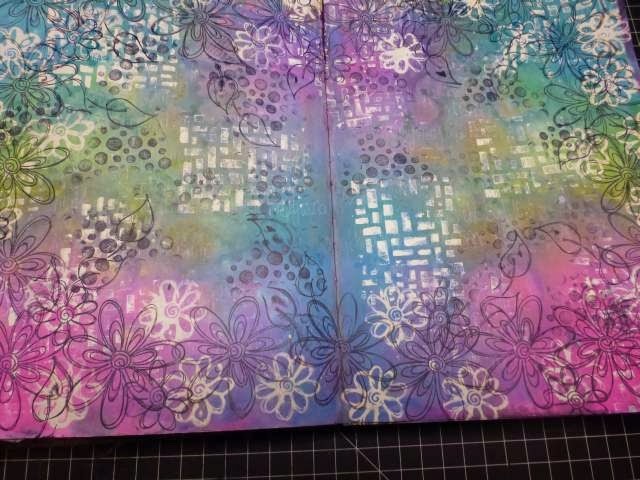 Going to look for the white linnen ink spray and love how you build up that flower, going to try that too.